Unlike hamsters, gerbils are best kept in pairs or larger groups. The introduction of new gerbils that are older than 10 weeks old can be difficult. Typically, trying to introduce a new gerbil to an already established group is discouraged as the group may gang up on and kill what it views as an intruder. Instead, try to introduce single gerbils to each other. A younger (less than 10 weeks old) gerbil mixed with an adult seems to work particularly well with males. Females may be harder to introduce to each other. These are the steps you should try to introduce single gerbils to each other with the hopes that they will accept each other and be able to live together. This process is not instantaneous. But with some patience and time, there is a chance they will live harmoniously. 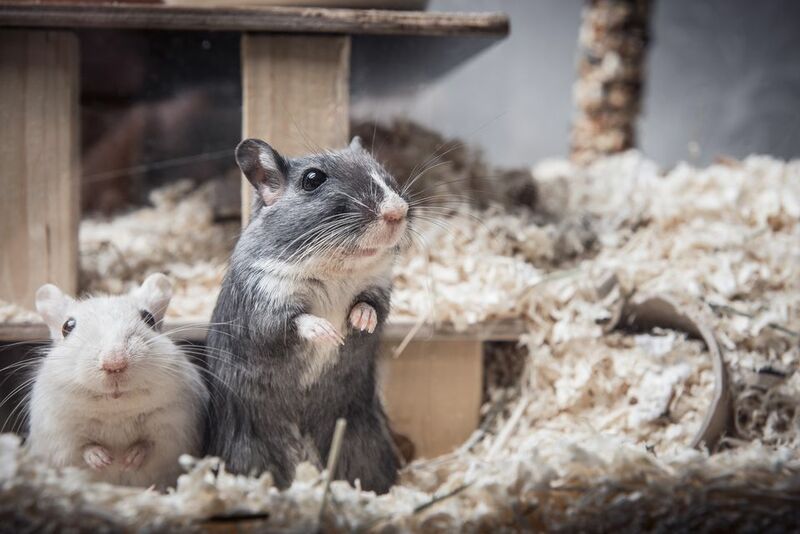 Get an already divided cage or use a smaller cage within a larger cage to allow the gerbils to see and smell each other without having physical contact. Plexiglass pieces can be used to divide a cage that you already have. Place one gerbil on each side of the divider so that they can see but not touch each other. Several times a day alternate the side that each gerbil lives on so they get used to each others' scent. Continue swapping the gerbils from side to side for a minimum of 7 days (longer is even better). Often times the gerbils will start sleeping near one another on opposite sides of the divider. If this happens, this is a good indicator that the gerbils are accepting of one another. Once the gerbils appear curious and not aggressive towards each other, the divider can be removed. Once the gerbils are joined together, watch them carefully. Stay near the cage for the first 20 minutes of their time together and have leather gloves handy in case you need to separate fighting gerbils. Gerbils will often playfight by boxing and chasing each other and squeaking. These behaviors are fine but if serious fighting occurs, you need to separate them. A serious fight usually involves a gerbil forming a tight ball and rolling around, squeaking shrilly, biting at each other's necks, and often, blood is drawn. After 20 minutes, if there have been no altercations, you should be able to distance yourself from the cage, but continue to check in on the gerbils for another three or four hours to monitor their behavior. If there is no fighting after a few hours of being together, the gerbils can be left together. If they cuddle up to sleep and groom each other they will likely be okay. If the gerbils fight, separate them and go back to the divided cage stage and repeat. This time, you will need to keep them divided for a longer period of time. Watch for any signs of bite wounds and fighting over the first several days and go back to the divided cage if they seem to be injuring each other. If you find that you have gone back to the divided cage stage two to three times after fights, and the fighting still does not stop, it sounds unlikely that the gerbils will ever get along. Which Small Rodent Is the Right Pet for You? How Can You Tell if Your Degus are Playing or Fighting? What Should Your Pet Gerbil Eat? Help, My Hamster is Sneezing!